An economy prospers to the degree that a government does not interfere with, manipulate, or control prices. The test that distinguishes good from bad government law and regulation of the economy is that bad government law and regulation interferes with, manipulates, or controls prices. An economy is a trust system. It requires a modicum of honesty to survive and a great deal of honesty to thrive. The Soviet Union fell because it would not allow prices to tell the truth about the economy. Why are we repeating the same mistake? Why won’t the US Federal Reserve allow truthful prices? Dishonest prices both impede recovery and feed economic and political corruption. 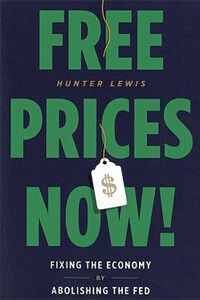 Hunter Lewis not only tells us what is wrong with our economy. He tells us what to do about it. Hunter Lewis, co-founder of the global investment firm Cambridge Associates, LLC, has written eight books on economics and related subjects, including the widely acclaimed Are the Rich Necessary? (“Highly provocative and highly pleasurable.”—New York Times) and Where Keynes Went Wrong. He has contributed to the New York Times, the Times of London>, the Washing­ton Post, and the Atlantic Monthly, as well as numerous websites such as Forbes.com. He has served on boards and committees of fifteen leading not-for-profit organizations, including environmental, teaching, research, and cultural organizations, as well as the World Bank.